At the recent meeting of our Management Committee we sat around a most wonderful table. A table made from a boat. This boat belonged to J M ‘Malcolm’ Gillies and was restored at his shack on Shannon Lagoon. According to Doctor Tony Large, Malcolm’s fishing companion, it was called ‘The Little Cockle’. It is a 10 foot Kitt Craft powered by a British Seagull Motor, both dating from c.1960. 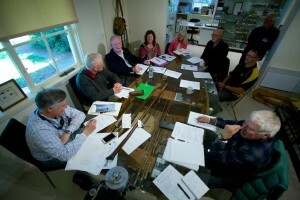 This photo shows some of the members of our committee & guests seated at the boat (table), from L-R: Mike, Peter, Andrew, Fiona, Hilary, Rex, Stuart, Hugh, and Bob (standing). Photo taken by Nick Taransky.